There seem to be thousands of Christian bookstores today filled with “how-to” books—“How to have a happy life,” “How to have a happy marriage,” “How to raise your children,” “How to be financially solvent.” We like quick and easy fixes. It’s like putting food in the microwave and pushing the button—“pshht”—just like that, it comes out ready. Instantaneous Christianity! But brokenness in our lives is a process, one that we continually learn and grow in. May the Lord help us all as we go through this life. Slowly but surely we are learning. God never gives up on us. Consistently He works with us. He never says, “I can’t work with you anymore. You are hopeless.” Even when we are faithless, He remains faithful. We can trust Him always, even when we fail. He is all good, all perfect and all love to us. Thank You for Your Word that comes to our hearts as an encouragement. You are working with us, changing us day-by-day to prepare us for eternity and to restore to us that which was lost. Your intention is to make us more like Your Son. Lord, thank You for working with us. Make us teachable like little children. Give us Your grace to stay soft and broken. In Jesus’ name, Amen. This entry was posted in The Beauty of Christ Through Brokenness and tagged beauty, brokenness, Christ, Christian, Christianity, Dr. KP Yohannan, encouragement, gfa, Gospel for Asia, K.P. Yohannan, KP Yohannan on January 6, 2011 by gfaseo. 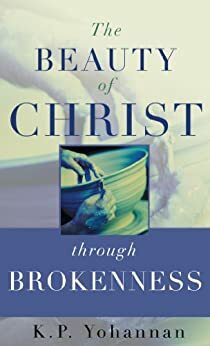 This entry was posted in The Beauty of Christ Through Brokenness and tagged beauty, brokenness, Christ, Christianity, Dr. KP Yohannan, encouragement, gfa, Gospel for Asia, K.P. Yohannan, KP Yohannan on January 4, 2011 by gfaseo.